Is the Gryphon Tour CC the best hockey stick for defenders? Fancy bow’s, grippy head faces, 3D zones and grooves, if you are a field hockey defender you probably don’t care much for the mind boggling technology our sticks can be riddled with these days. Your job as a defender is to win back the ball, block shots on goal and clear the lines. Can’t you just get a hockey stick that’s normal??? If this is your plea, the maybe the Gryphon Tour CC might just be the best hockey stick for defenders! No fuss, just park the bus! A straighter bottom section to the shaft and reasonable (notice reasonable, not ‘extreme’) gives the Gryphon Tour CC more of a feel of a straight sick than a curve. Don’t get me wrong, for most skilful players this stick is aimed at, the Tour CC has enough curve to launch those down field aerials. It’s just a bit more subtle as it’s a 23mm curve instead of 24/25mm which some are, and is positioned slightly higher in the shaft at 300mm. Reach is awesome on the Gryphon Tour CC because of this and while it’s still available in normal sizes, the straighter lower section gives it a feel of being longer for good solid channelling and tackling options. I jest a little about the ‘no fuss’ this Gryphon Tour CC is still a top quality hockey stick. Those who know Gryphon will know that they are built great and the Tour CC from the 2017 season we review is no different. Gryphon don’t publish exact carbon content figures but it’s obvious the Tour range is 100% carbon. The addition in 2017 of what they call the ‘silicon sleeve’ reduces the vibrations and also helps hits feel more crisp. Always the best thing about Gryphon sticks is how hard they hit the ball. 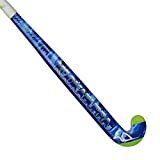 With the straighter shaft the Tour CC, this hockey stick plays slap shots particularly well and when you are an important part of moving the ball back and round, this additional power is well received. It seems the sweet spot on this Gryphon Tour CC is huge and therefore making big hits up field, clearing out of the last quarter while under pressure and even fulfilling a shot hitting role for penalty corners is easily achieved. In my experience Gryphon and Kookaburra’s shaft shapes and stick make up are the best for defenders, the Tour CC in 2017 certainly fits the bill. Made with some serious material in a methodical way, the Gryphon Tour CC really does everything a defender needs, and more. The shape is controllable, the power is immense and there’s enough quality to keep this stick in your bad for a number of seasons.